Did you know that switching to a more expensive diet could save you money in the long-run? Not everyone favours the commercial diet but there are plenty that do. While some are passionate about the benefits of alternative diets i.e. home-cooked or raw, others are incredibly satisfied with the standard of commercial diets out there and choose to feed them as a staple diet. If you fall into the latter category, hopefully this article will guide you through the sea of choice that is commercial dog food and encourage you to opt for quality over price. In fact, switching to a more expensive diet might actually be more economical for you in the long-run. So, where to begin. First of all, it is worth considering your dog’s nutritional needs. Dogs are of the genus Canis and the order Carnivora, along with their wolf ancestors. You just have to look at a dog's teeth to work out its intended diet. However, being a carnivore implies that fulfilling a dog's nutritional needs is solely dependent on meat, meat, meat. But how far is this true? Look at it this way, pandas are also of the order Carnivora but their diet consists mainly of bamboo and other herbaceous shoots and leaves. In fact, based on diet alone, pandas are obligate herbivores. It would be better to think of dogs as omnivores, like us, that can exist on a combination of vegetables and meat. While they are dependent on meat-specific protein to an extent, they can adapt without it. Yes, dogs ate raw meat in the wild, but they also lived shorter lives. Diets that focus almost exclusively on feeding meat (or vegetables, as the case may be) are by no means balanced or beneficial. Dogs need their protein, but they must get their vitamins and minerals from somewhere and a good ratio to go by is 50% meat and 50% vegetables. Their feeding behaviour, however, would imply that dogs are actually ‘opportunivores’ that will eat whatever’s going. So, we have learnt that getting the balance right is important. If you were thinking about feeding a vegetarian diet to your dog, think again. Dogs need protein to thrive and supplements are no substitute for what meat can provide. As we know, fresh meat is expensive to buy and dogs can consume more of it than we can, pushing up the cost even more. For many, this is one of the reasons a raw diet is just not practical. Choosing a commercial diet isn’t about being lazy; it’s about choosing something you believe to be balanced and complete that is also convenient and palatable. There is little risk of your dog contracting salmonella or bacterial infections from commercial kibble, as many have done from raw diets. You can also be sure your dog is getting the blend of nutrients it needs most, from a recipe that has been carefully formulated and tested. 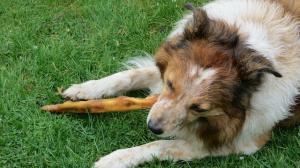 If the diet you feed your dog is working, albeit raw or commercial, stick with it. For many people, commercial dog food works wonders. In truth, the more expensive commercial diets contain the highest percentage of expensive ingredients like meat. Cheap dog foods actually contain very little meat. Food labels can mislead us into thinking the ingredients contained in the product are appealing i.e. 'chicken meal' or 'dried chicken' sounds quite promising but is in fact the rendered down feather shafts, entrails and carcasses of the chicken, as opposed to its actual meat. That said, 'meat meal' is much more nutritionally concentrated than fresh meat, so your dog will need to consume less of it to reap the benefits. Cheap, low-quality dog foods are likely to include meat meal as their main sources of protein, whereas higher quality foods will include it alongside fresh meat and vegetables (as opposed to 'bulking ingredients' like cereals and fillers). A very cheap dog food is cheap for a reason. It’s not because the company has decided out of the goodness of their heart to make a cheap pet food; it’s because the ingredients in it are extremely cheap ingredients. Even if the cheap dog food you are feeding now seems to be suiting your dog, the older it gets the more likely it is to experience problems. Fillers can trigger allergies; while too much salt can cause problems similar to those we might encounter ourselves. It is possible that further down the line, the money you've saved on dog food over the years will be made up in vet bills. Yes, cheap dog food may be kind on your wallet, but spending a little more can really be more economical. In fact, many people that now buy a quality diet report that it lasts significantly longer than a cheaper alternative. For a start, higher quality dog food has a richer nutrient content and provides more of what your dog needs for energy and nourishment. It also contains fewer bulking ingredients such as grain and cereal that consist of empty calories and have no nutritional benefit at all. Because the food offers more of what your dog actually needs, it can consume less of it than a cheaper diet. A smaller amount of high quality food provides more energy and keeps your dog feeling fuller for longer, meaning a bag of food goes the extra mile. It is likely you will get through more cheap food than you would if you switched up to something a little more expensive as your dog will keep coming back for more every time its energy reserves peter. A diet that is richer in meats, vegetables and essential oils will also keep your dog's stools firmer and more regular. VioVet sells a range of dog foods ranging in price and popularity, to meet everyone's needs and preferences. Barking Heads is a popular brand with a commendable philosophy towards pet food, striving to produce diets that are naturally wholesome and nutritionally beneficial in their ingredient content. Barking Heads is proud to use only UK-sourced ingredients in their range of diets, including a high percentage of selected meats and fish such as lamb, chicken and salmon. White and brown rice is high in digestible fibres and ground oats provide digestive support while helping to manage cholesterol. The diets also contain a hearty blend of potatoes, vegetables (tomatoes, carrots and sweet potatoes), and essential vitamins and prebiotics. It is worth noting that Barking Heads include no unnecessary fillers in their diets because of their high meat and vegetable contents. To view their range, click here. Another brand with a shining reputation for producing pet foods with a high meat content is Orijen. Sourcing only the freshest regional ingredients from Western Canada's 'foothill farms, fertile prairies and cold clear waters,' Orijen is committed to the nutritional needs of your dog, so much so that you'll be hard-pressed to find a better quality commercial diet out there. All Orijen recipes are nutritionally balanced and complete, and are free from preservatives and high-glycemic carbohydrates. Orijen recognises your dog as a carnivore, hence its inclusion of fresh whole meats, tripe, liver, cartilage and marrow in its diets. The company also ensures 20% of every recipe is made up of fruits, vegetables and botanicals to help strengthen and support internal functions and eliminate harmful toxins. To view Orijen's range, click here. There are many other high-quality brands worth mentioning i.e. Lily's Kitchen, but they are easy enough to find by checking food labels before you buy. If the ingredients list is simple and the meat content is high, you are probably onto a winner. Try to avoid foods that contain lots of grain, cereal and 'chicken meal' as the diet is unlikely to be nutritionally balanced. Next time you are buying your dog's food, consider how much you are spending on a bag and how long it is lasting you. Do some research and invest a little bit extra in what you feed your dog, as a quality diet that contains the essentials for health, energy and growth will go a lot further than a cheap commercial diet bulked to the hilt. There is no disputing that Royal Canin is a premium quality kibble that suits many dogs. A great deal of dog owners swear by the brand and would feed their animals nothing else. All Royal Canin diets are formulated with a dog's nutritional needs in mind and are safety tested, meaning they come with a level of quality assurance and gaurantee. Royal Canin are good at tailoring diets to a specific need i.e. weight management, so it should be an effective diet for your dog if, as you say, he is a little overweight. As long as Royal Canin suits your dogs and the diets are meeting the need they were intended for, there is no reason to change onto something else. On the other hand, if you feel your dogs are not thriving, it might be worth giving another brand a try. I have a 3yr old Staffordshire Bull Terrier called Dodger.He has been neutered as he is from a rescue centre. Shortly after I got him 3 months ago he jumped up on my wardrobe and ate a large amount of Ibuprofen pills.. Thank goodness he survived but is left with colitis. He has graduated successfully from a bland diet to a more normal one but I'm not sure which dried food to use. He did well on Royal Canin prescription sensitive diet when he was ill but it is very expensive to use all the time and he doesn't like it that much. I bought Barking Heads large dog dried food but this gives him diarrhoea. Stupidly, I bought a large sack that I am now having to give away. My other dog has Barking Heads dried food for older dogs. I've found that Dodger likes this and it has no ill effects. However, he is a very active dog and needs to gain weight so I need to find something more appropriate. At the moment I add meat or fish to the dried food but would like to find a more suitable complete food for him. Can you recommend a sensitive diet that is tasty and nutritious and that I can try in a small sized pack first? Do you rate Burns food? Thanks. We wanted to choose the best kibble as possible for our Rhodesian Ridgebacks - we started with Orijen Puppy large breed. It was unfortunately "too rich", causing diarrhea, so we switched to Acana Puppy large breed - looked like its working - but the diarrhea issues used to come back every now and then. Itchy ears and yeast infection issues - once in every two month. Once our older dog became 13 month old - we switched (very slowly) to Acana Pacifica - worked well for 3 weeks, but after poor boy had bloody diarrhea and has been diagnosed with colitis. We kept him on a chicken & rice diet for a week (as the vet told us) and tried to introduce him to a new kibble (Acana Grasslands) after. He had a relapse after 4 days. I didn't find any bad reviews about Champion Petfood and their products at all - I was devastated trying to find the solution. After consulting with 3 different vet and nutrition experts and a holistic vet - we decided to switch them to raw. I have to say - I was completely against it in my entire life, but looks like it's working for them. No more colitis, no more yeast infections, no more skin problems. They are calmer and than ever. Also no more hyper times - but more energy in general. I don't make this up, feel free to check my orders (i ordered from Viovet all the time). I have to order Nutriment raw from somewhere else now but if you maybe consider to start selling their products in the future - let me know, I like your customer service a lot. I wanted to share our story with you because sometimes processed food just don't work - even if you try to buy the best, just like I did. We chose 'Canagan' kibble for our high energy cocker/springer. Made in England, high quality ingredients in appropriate quantities and grain free. The dog is a testament to this excellent food. Strongly recommend giving it try. We have 3 working dogs and feed them Gilpa Kennel. Mainly because it has 20% protein & 10% fats & oils, this I believe is the best ratio for active dogs. It also contains green lipped muscle extract, fantastic for their joints, not so good for breath though! They are never hyperactive & enjoy their downtime calmly. They're coats are amazing, they're weights are ideal, they only waste what their bodies don't need & we are very happy with it & have no intention of changing. Our oldest was started on Burns which we heard was one of the best, he struggled to gain weight with this one and quite a few others of the same type & price, I believe this was due to the feed being so concentrated & compact some dogs systems just can't break them down enough to get all the nutrients it needs. As soon as he started Gilpa Kennel, he started to gain weight and was more satisfied. It works well for our other two too and at Â£17.50 a bag is a no brainier. During my trial & error period the staff at gilbertson & page were also extremely helpful and supportive, they happily sent out free samples and small supplies in between us trying theirs & other brands! Conclusion- don't be fooled into thinking that you have to spend Â£45 a bag on dog food, you don't always get what you pay for! !